She probably shouldn’t be in a blog entry purporting to be about comedy, but when books are this good they belong anywhere. Get any of them; laugh out loud they may not be, great books they absolutely are. Heart warming, stomach churning, page turner. 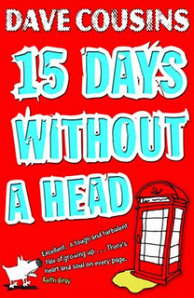 Takes the idea that if you chop off a cockroach’s head it can live for 15 days, and then uses that fact to examine alcoholism, teen abandonment and having to grow up way way way before you should. Can these two brothers survive until their mother gets back? Will their mother get back at all? 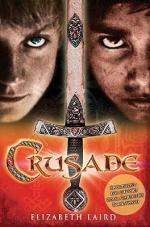 This is stealth comedy, there is more heart in this than in most other YA books put together. Plus it makes you wince. And just shout ‘no!’ at the hero. Dave talked about how comedy was his way of tackling ‘serious issues’, how he used it to smuggle in some very ‘unfunny’ themes. Proper grown up young fiction. I have others by him which have gone straight to the top of the queue – I’ll keep you posted. Jonathan Meres – the world of Norm. 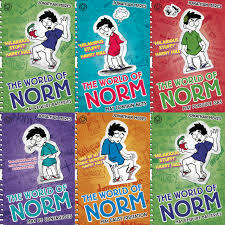 There are now I think 8 ‘worlds of Norm’ and they are very very funny. Jonathan did stand up for years and it really shows. He has written many other things, but I would tentatively say he has found what he should be doing. Every book starts ‘Norm knew it was going to be one of those days when…’ and then something hideous happens and it gets worse from there. Norm is everyboy, getting into everyday trouble, everyday. And that’s the charm of it. Who hasn’t been Norm at some stage? (or maybe that’s just me). Again this is full of heart, and laugh out loud with it. Love it! How can you not like a title like that? It’s super contemporary, but the story is timeless. 15 year old boy wants to not be a metal head geek by the time he’s 16. What all these books have in common is that they’re all about heart, and while they may not take themselves remotely seriously, (as no good comedy should), they are all utterly identifiable with (sorry about tortuous sentence structure), empathiseable with (ouch!) and genuinely funny. I never knew I’d been a secret metal head until I met Josh, but I must have been as it all felt too horribly familiar. Magic. How are you not going to pick this book up and start reading? Jeff has written the hugely successful Metawars series, and then just decided to have a go at comedy. Curse him! Mutant Zombie bees? A chupacabra? A glampire love interest (actually that’s my joke, I’ll take credit for calling her that) – it’s fabulous. 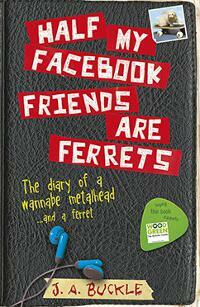 Proper anarchic and utterly human comedy. So, a lot of very different comic writing, and a lot of different comic writers. All using humour in very different ways. So interesting that such different books can all happily co-exist under the banner of comedy. And there are so many others that weren’t featured. Personally I’d have loved to have Frank Cottrell Boyce there, and I’m sure the others would have picked someone completely different. My children expressed surprise that I was being deemed a ‘comic writer’ – all I can say is that if I’m considered to be in such company then I’m a happy boy.